Day 5!!! This is the last day of the challenge! How is everyone feeling? When you get on the scale tomorrow, let me know, do you have weight loss? Do you feel more energetic? What was your favorite meal? Overall what did you think of the challenge? Helpful? Did you at least come out with a few meals that you really liked? I enjoy this breakfast a lot! I eat this quite a bit since doing the challenge. It feels a little fancy with the bacon (I just cook it in the microwave so it is quick!) but the toast with jelly is quicker than the eggs and tomato from day one. I don't love the sugar free jelly, but it isn't bad enough that I can't eat it, I would just prefer a little sugar! Morning snack, again just use the Greek yogurt as a substitute. My Shakeology samples are on the way, I can't wait to try them. I will keep you all posted! If you want to order them contact Carrie here. For lunch I used the deli turkey in the wrap, and used grapes instead of tomatoes because I wanted something sweet and it just sounded good...and it was! Play around with stuff, you never know what you might like! Afternoon snack veggies with cottage cheese, not my fave. I really preferred the veggies plain but it does give some protein. Hummus would probably do the trick as an alternative! For dinner, another marinating overnight recipe. I don't think I did that the first time though and it was fine. I bought a tenderloin,which is what the shopping list called for the first time, but had so much left over. The second time I bought just pork chops. I also felt it was way to much Rosemary. Maybe if you are a lover of Rosemary you wouldn't feel that way? But I would definitely cut down the amount. So that's it! We are done! 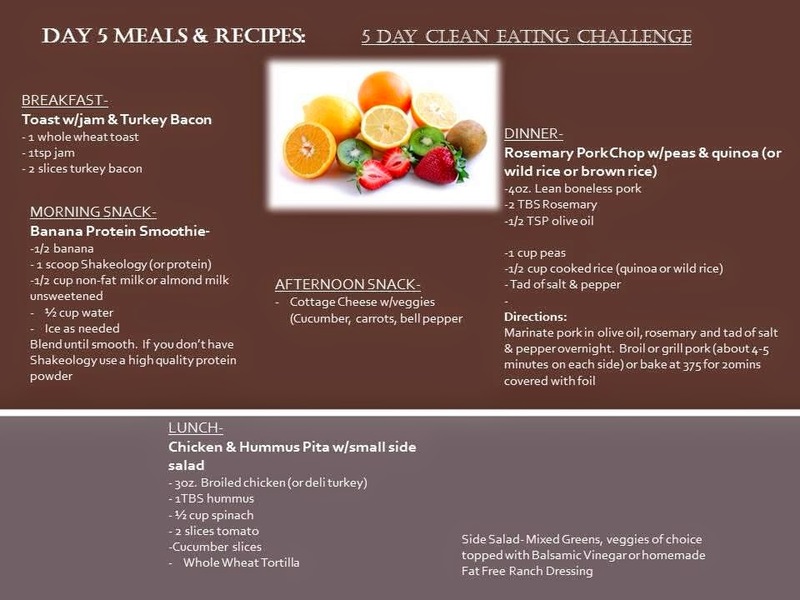 If you didn't get to do the challenge this week or want to do it again, you can get all the information in one place at the top of the page under 5 Day Clean Eating Challenge. The shopping list, menus and daily posts are all there. Hope it went well for you! 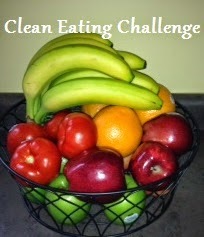 ***Disclaimer - I was given this Clean Eating Challenge by a Beachbody coach, I am not a dietician of any sort. I am just passing along a great menu plan that was given to me! If you have any questions I will gladly try to find the answers for you.